The Chilembwe uprising was a rebellion against British colonial rule in Nyasaland (modern-day Malawi) in January 1915. Led by John Chilembwe, an American-educated black millenarian Christian minister, the uprising was based around his church in the village of Mbombwe in the south-east of the country. It was centred on the black middle class and encouraged by grievances against the colonial system, including forced labour, discrimination and the new demands on the indigenous population caused by the outbreak of World War I. The revolt broke out in the evening of 23 January 1915, when rebels, incited by Chilembwe, attacked the A. L. Bruce plantation's headquarters at Magomero and killed three white colonists; and a largely unsuccessful attack on a weapons store in Blantyre followed during the night. By the morning of 24 January the colonial authorities had mobilised the white settler militia and redeployed regular military forces south. After a failed attack on Mbombwe by troops of the King's African Rifles (KAR) on 25 January, a group of rebels attacked a Christian mission at Nguludi and burned it down. The KAR and militia took Mbombwe without encountering resistance on 26 January after many of the rebels, including Chilembwe, fled, hoping to reach safety in neighbouring Portuguese East Africa (modern Mozambique). About 40 rebels were executed in the revolt's aftermath, and 300 were imprisoned; Chilembwe was shot dead by a police patrol near the border on 3 February. Although the rebellion did not itself achieve lasting success, it is commonly cited as a watershed moment in Nyasaland history. The rebellion had lasting effects on the British system of administration in Nyasaland and some reform was enacted in its aftermath. After World War II, the growing Malawian nationalist movement reignited interest in the Chilembwe revolt, and after the independence of Malawi in 1964 it became celebrated as a key moment in the nation's history. Chilembwe's memory, which remains prominent in the collective national consciousness, has often been invoked in symbolism and rhetoric by Malawian politicians. Today, the uprising is celebrated annually and Chilembwe himself is considered a national hero. British colonial rule in the region of modern-day Malawi, where the revolt occurred, began between 1899 and 1900, when the British sought to increase their formal control over the territory to preempt encroachment by German or Portuguese colonial empires. The region became a British protectorate in 1891 (as "British Central Africa") and in 1907, was named Nyasaland. Unlike many other parts of Africa, where British rule was dependent on the support of local factions, in Nyasaland British control rested on military superiority. During the 1890s the colonial authorities put down numerous rebellions by the local Yao, Ngoni and Cewa peoples. British rule in Nyasaland radically altered the local indigenous power structures. The early colonial period saw some immigration and settlement by white colonists, who bought large swathes of territory from local chiefs, often for token payments in beads or guns. Most of the land acquired, particularly in the Shire Highlands, was converted into white-owned plantations where tea, coffee, cotton and tobacco were grown. The enforcement of colonial institutions, such as the Hut Tax, compelled many indigenous people to find paid work and the demand for labour created by the plantations, led to their becoming a major employer. Once employed on the plantations, black workers found that they were frequently beaten and subject to racial discrimination. Increasingly, the plantations were also forced to rely on a system of forced labour or corvée, known locally at the thangata. John Chilembwe, born locally in around 1871, received his early education at a Scottish mission and later met Joseph Booth, a radical Baptist missionary who ran the Zambezi Industrial Mission. Booth preached a form of egalitarianism and his progressive attitude towards race attracted Chilembwe's attention. Under Booth's patronage, Chilembwe travelled to the United States to study at a theological college in Virginia. There he mixed in African-American circles and was influenced by stories of the abolitionist John Brown and the egalitarianist Booker T. Washington. Chilembwe returned to Nyasaland in 1900 and founded his own independent church, the Providence Industrial Mission, in the village of Mbombwe. He was considered a "model of non-violent African advancement" by the colonial authorities during the mission's early years. He established a chain of independent black African schools, with over 900 pupils in total and founded the Natives' Industrial Union, a form of cooperative union that has been described as an "embryo chamber of commerce". Nevertheless, Chilembwe's activities led to friction with the managers of local plantations, who feared Chilembwe's influence over their workers. In November 1913, employees of the local Alexander Livingstone Bruce Plantation burnt down Chilembwe's church in Mbombwe, though it was soon rebuilt. Chilembwe preached a form of Millenarian Christianity, common in southern Africa at the time, which predicted the liberation of the Africans and the end of colonial rule. He preached aggressive sermons, often from the Old Testament, concentrating on aspects such as the Israelites' escape from slavery in Egypt. Chilembwe's activities were initially supported by white missionaries. Information about his Church before the rebellion is scant, but his ideology proved popular and he developed a strong local following. Chilembwe was not part of the apocalyptic Watchtower (Kitawala) movement, which was popular in central Africa at the time but some of his followers may have been influenced by it. Kitawala predicted that the Apocalyse would occur in October 1914 and that God would then come to earth and end colonialism. Chilembwe's ideology grew more aggressive in the decade after his return to Nyasaland. He became demanding of his followers, encouraging them to adopt European-style intellectual improvement. The Mission's schools meanwhile began teaching racial equality, based on Christian teaching and anti-colonialism. Chilembwe adopted Western dress, customs and ideas and encouraged his followers to do likewise. Many of his followers came from the local middle-class, who had similarly adopted European customs. Chilembwe's acceptance of European culture created an unorthodox anti-colonial ideology based around a form of nationalism, rather than a desire to restore the pre-colonial social order. World War I broke out in July 1914. 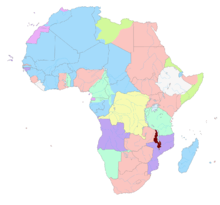 By September 1914, the war had spread to Africa as the British and Belgians began a long military campaign against the German colonial army in German East Africa. 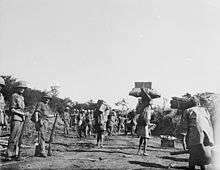 In Nyasaland, the major effect of the war was massive recruitment of Africans to serve as porters in support of the Allied armies. Porters lived in extremely poor conditions and many died. At the same time, the recruitment of porters created a shortage of labour which increased the economic pressure on Africans in Nyasaland. Preparations for the uprising had begun by the end of 1914. Chilembwe acquired a military manual and began to organise his followers and wider support. In particular, he formed close ties with Filipo Chinyama in Ncheu, 110 miles (180 km) to the north-west and received his assurance that he would also mobilise his followers to join the rebellion when it broke out. The colonial authorities received two warnings that a revolt was imminent. A disaffected follower of Chilembwe reported the preacher's "worrying intentions" to Philip Mitchell, a minor colonial functionary who later served as Governor of Uganda and Kenya, in August 1914. A Catholic mission was also informed. Neither took any action. "This is the only way to show the whitemen, [sic] that the treatment they are treating our men and women was most bad and we have determined to strike a first and a last blow and then we will all die by the heavy storm of the whiteman's army. The whitemen will then think, after we are dead, that the treatment they are treating [sic] our people is bad, and they might change to the better for our people." During the night of Saturday 23–24 January, the rebels met at the Mission church in Mbombwe, where Chilembwe gave a speech stressing that none of them should expect to survive the reprisals that would follow the revolt but that the uprising would draw greater attention to their conditions and destabilise the colonial system. This, Chilembwe believed, was the only way change would ever occur. A contingent of rebels was sent to Blantyre and Limbe, about 15 miles (24 km) to south, where most of the white colonialists lived and where the insurgents hoped to capture the African Lakes Company's store of weapons. Another group headed towards the Alexander Livingstone Bruce Plantation's headquarters at Magomero. Chilembwe sent a messenger to Ncheu to alert Chinyama that the rebellion was starting. Chilembwe also sought support for his uprising from the German forces in German East Africa, on Nyasaland's far northern border, hoping that a German offensive from the north combined with a native insurrection in the south might force the British out of Nyasaland permanently. On 24 January, he sent a letter to the German Governor by courier through Portuguese East Africa. The courier was intercepted and the letter was never received. During the latter stages of the East African Campaign, after the German invasion of Portuguese East Africa, the German colonial army actually helped to suppress anti-Portuguese rebellions, among the Makombe and Barue peoples, worrying that African uprisings would destabilise the colonial order. The major action of the Chilembwe uprising involved an attack on the Bruce plantation at Magomero. The plantation spanned about 5,000 acres (2,000 ha) and grew both cotton and tobacco. Around 5,000 locals worked on it as part of their thangata obligations. The plantation had a reputation locally for the poor treatment of its workers and for the brutality of its managers, who closed local schools, beat their workers and paid them less than had been promised. Their burning of Chilembwe's church in November 1913 created a personal animosity with the rebel leadership. The insurgents launched two roughly concurrent attacks—one group targeted Magomero, the plantation headquarters and home of the main manager William Jervis Livingstone and a few other white staff, while a second assaulted the plantation-owned village of Mwanje, where there were two white households. The rebels moved into Magomero in the early evening, while Livingstone and his wife were entertaining some dinner guests. The estate official, Duncan MacCormick, was in another house nearby. A third building, occupied by Emily Stanton, Alyce Roach and five children, contained a small cache of weapons and ammunition belonging to the local rifle club. The insurgents quietly broke into the Livingstone's house and injured him during hand-to-hand fighting, prompting him to take refuge in the bedroom, where his wife attempted to treat his wounds. The rebels forced their way into the bedroom, and after capturing his wife, decapitated Livingstone. MacCormick, who had been alerted, was killed by a rebel spear. The attackers took the women and children of the village prisoner but shortly released them unhurt, having reportedly treated them well. It has been suggested that Chilembwe may have hoped to use the women and children as hostages, but this remains unclear. The attack on Magomero, and in particular the killing of Livingstone, had great symbolic significance for Chilembwe's men. The two Mauser rifles captured from the plantation formed the basis of the rebel armoury for the rest of the uprising. Mwanje had little military value but it has been proposed that the rebels may have hoped to find weapons and ammunition there. Led by Jonathan Chigwinya, the insurgents stormed one of the houses and killed the plantation's stock manager, Robert Ferguson, with a spear as he lay in bed reading a newspaper. Two of the colonists, John Robertson and his wife Charlotte, escaped into the cotton fields and walked 6 miles (9.7 km) to a neighbouring plantation to raise the alarm. One of the Robertsons' African servants, who remained loyal, was killed by the attackers. The rebels cut the Zomba-Tete and Blantyre-Mikalongwe telephone lines, delaying the spread of the news. The African Lakes' Company weapons store in Blantyre was raided by a force of around 100 rebels at around 02:00 on 24 January, before the general alarm had been raised by news of the Magomero and Mwanje attacks. The defenders mobilised after an African watchman was shot dead by the rebels. The insurgents were repulsed, but not before they had captured five rifles and some ammunition, which was taken back to Mbombwe. A number of rebels were taken prisoner during the retreat from Magomero. After the initial attacks on the Bruce plantation, the rebels returned home. Livingstone's head was taken back and displayed at the Providence Industrial Mission on the second day of the uprising as Chilembwe preached a sermon. During much of the rebellion, Chilembwe remained in Mbombwe praying and leadership of the rebels was taken by David Kaduya, a former soldier in the King's African Rifles (KAR). Under Kaduya's command, the rebels ambushed a small party of government soldiers near Mbombwe on 24 January, described as the "one reverse suffered by the government" during the uprising. By the morning of 24 January the government had levied the Nyasaland Volunteer Reserve, a settler militia and redeployed the 1st Battalion, KAR from the north of the colony. The rebels did not mount any further attack any of the many other isolated plantations in the region. They also did not occupy the boma (fort) at Chiradzulu just 5 miles (8.0 km) from Mbombwe, even though it was ungarrisoned at the time. Rumours of rebel attacks spread, but despite earlier offers of support, there were no parallel uprisings elsewhere in Nyasaland and the promised reinforcements from Ncheu did not materialise. The Mlanje or Zomba regions likewise refused to join the uprising. Troops of the KAR launched a tentative attack on Mbombwe on 25 January but the engagement proved inconclusive. Chilembwe's forces held a strong defensive position along the Mbombwe river and could not be pushed back. Two African government soldiers were killed and three were wounded; Chilembwe's losses have been estimated as about 20. On 26 January, a group of rebels attacked a Catholic mission at Nguludi belonging to Father Swelsen. The mission was defended by four African armed guards, one of whom was killed. Swelsen was also wounded in the fighting and the church was burnt down. The military and militia forces assaulted Mbombwe again the same day but encountered no resistance. Many rebels, including Chilembwe, had fled the village disguised as civilians. Mbombwe's fall and the government troops' subsequent demolition of Chilembwe's church with dynamite ended the rebellion. Kaduya was captured and brought back to Magomero where he was publicly executed. After the defeat of the rebellion, most of the remaining insurgents attempted to escape eastwards across the Shire Highlands, towards Portuguese East Africa, from where they hoped to head north to German territory. Chilembwe was seen by a patrol of Nyasaland police and shot dead on 3 February near Mlanje. Many other rebels were captured; 300 were imprisoned following the rebellion and 40 were executed. Around 30 evaded capture and settled in Portuguese territory near the Nyasaland border. Worrying that the rebellion might rapidly reignite and spread, the colonial authorities instigated arbitrary reprisals against the Nyasa population, including mass hut burnings. All weapons were confiscated and fines of 4 shillings per person were levied in the districts affected by the revolt, regardless of whether the people in question had been involved. The colonial government also begun attacking the rights of missionaries in Nyasaland and banned many independent churches, including Kitawala, from Nyasaland, and placed restrictions on other African-run churches. Public gatherings, especially those associated with African-initiated religious groups, were banned until 1919. Fear of similar uprisings in other colonies, notably Northern Rhodesia, also led to similar repression of independent churches and foreign missions beyond Nyasaland. Though the rebellion failed, the threat to colonial rule posed by the Chilembwe revolt compelled the local authorities to introduce some reform. The colonial government proposed to undermine the power of independent churches like Chilembwe's, by promoting secular education but lack of funding made this impossible. The government began to promote tribal loyalties in the colony, through the system of indirect rule, which was expanded after the revolt. In particular, the Muslim Yao people, who attempted to distance themselves from Chilembwe, were given more power and autonomy. Although delayed by the war, the Nyasaland Police, which had been primarily composed of African askaris levied by local white officials, was restructured as a professional force of white colonists. Forced labour was retained, and would remain a resentment for decades afterwards. In the aftermath of the revolt, the colonial administration formed a Commission of Enquiry to examine the causes and handling of the rebellion. The Commission, which presented its conclusions in early 1916, found that the revolt was chiefly caused by mismanagement of the Bruce plantation. The Commission also blamed Livingstone himself for "treatment of natives [that was] often unduly harsh" and for poor management of the estate. The Commission found that the systematic discrimination, lack of freedoms and respect were key causes of resentment among the local population. It also emphasised the effect of Booth's ideology on Chilembwe. The Commission's reforms were not far-reaching—though it criticised the thangata system, it made only minor changes aimed at ending "casual brutality". Though the government passed laws banning plantation owners from using the services of their tenants as payment of rent in 1917, effectively abolishing thangata, it was "uniformly ignored". A further Commission in 1920 concluded that the thangata could not be effectively abolished, and it remained a constant source of friction into the 1950s. Despite its failure, the Chilembwe rebellion has since gained an important place in the modern Malawian cultural memory, with Chilembwe himself gaining "iconic status." The uprising had "local notoriety" in the years immediately after it, and former rebels were kept under police observation. Over the next three decades, anti-colonial activists idealised Chilembwe and began to see him as a semi-mythical figure. The Nyasaland African Congress (NAC) of the 1940s and 1950s used him as a symbolic figurehead, partly because its president, James Chinyama, had a family connection to Filipo Chinyama, who had been believed to be an ally of Chilembwe's. When the NAC announced that it intended to mark 15 February annually as Chilembwe Day, colonial officials were scandalised. One wrote that to "venerate the memory of the fanatic and blood thirsty Chilembwe seems to us to be nothing less than a confession of violent intention." D. D. Phiri, a Malawian historian, characterised Chilembwe's uprising as an early expression of Malawian nationalism, as did George Shepperson and Thomas Price in their 1958 book Independent African, an exhaustive study of Chilembwe and his rebellion that was banned during the colonial era but still widely read by the educated classes. Chilembwe became viewed as an "unproblematic" hero by many of the country's people. 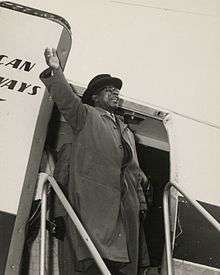 The Malawi Congress Party (MCP), which ultimately led the country to independence in 1964, made a conscious effort to identify its leader Hastings Banda with Chilembwe through speeches and radio broadcasts. Bakili Muluzi, who succeeded Banda in 1994, similarly invoked Chilembwe's memory to win popular support, inaugurating a new annual national holiday, Chilembwe Day, on 16 January 1995. Chilembwe's portrait was soon added to the national currency, the kwacha, and reproduced on Malawian stamps. It has been argued that for Malawian politicians, Chilembwe has become "symbol, legitimising myth, instrument and propaganda". The revolt has been the subject of much research and has been interpreted in various ways by historians. At the time, the uprising was generally considered to mark a turning point in colonial rule. The Governor of Nyasaland, George Smith, declared that the revolt marked a "new phase in the existence of Nyasaland". According to the military historian Hew Strachan, the Chilembwe uprising tarnished British prestige in East Africa which contributed, after the appointment of the future Prime Minister Andrew Bonar Law as Secretary of State for the Colonies, to renewed pressure for an Anglo-Belgian offensive against German East Africa. Chilembwe's aims have also come under scrutiny. According to Robert I. Rotberg, Chilembwe's speech of 23 January appeared to stress the importance and inevitability of martyrdom as a principal motivation. The same speech depicted the uprising as a manifestation of desperation but because of his desire to "strike a blow and die", he did not have any idea of what he would replace colonialism with if the revolt succeeded. Rotberg concludes that Chilembwe planned to seize power in the Shire Highlands or perhaps in all of Nyasaland. Some contemporaries of Chilembwe believed that he had planned to make himself "King of Nyasaland". John McCracken attacks the idea that the revolt could be considered nationalist, arguing that Chilembwe's ideology was instead fundamentally utopian and created in opposition to localised abuses of the colonial system, particularly thangata. According to McCracken, the uprising failed because Chilembwe was over-reliant on a small Europeanised petite bourgeoisie and did not gain enough mass support. Rotberg's examination the Chilembwe revolt from a psychoanalytical perspective concludes that Chilembwe's personal situation, his psychosomatic asthma and financial debt may have been contributory factors in his decision to plot the rebellion. Chimurenga—a rebellion against the British South Africa Company administration in nearby Southern Rhodesia in 1896–97. ↑ Rotberg 1967, pp. x–xi. 1 2 Rotberg 1967, p. xi. 1 2 3 4 Rotberg 1967, p. xiv. ↑ Rotberg 1967, pp. xv–xvii. ↑ McCracken 2012, pp. 128–9. 1 2 3 Rotberg 1967, p. xxi. ↑ Rotberg 1967, pp. xxiv–xxv. ↑ McCracken 2012, p. 132. 1 2 3 4 McCracken 2012, p. 133. 1 2 3 Rotberg 1971, p. 140. ↑ Linden & Linden 1971, p. 632. ↑ McCracken 2012, p. 136. ↑ McCracken 2012, pp. 133–4. ↑ McCracken 2012, p. 137. ↑ McCracken 2012, p. 128. 1 2 3 4 5 6 Strachan 2004, p. 132. ↑ Rotberg 1967, pp. 33–4. 1 2 Rotberg 1971, p. 162. 1 2 3 4 5 6 Rotberg 1971, p. 135. 1 2 Rotberg 1967, p. 48-9. ↑ Rotberg 1971, p. 163. ↑ Strachan 2004, p. 177. ↑ McCracken 2012, pp. 130–1. ↑ McCracken 2012, p. 130. 1 2 McCracken 2012, p. 131. 1 2 Shepperson & Price 1958, p. 274. 1 2 3 4 5 6 7 8 Rotberg 1971, p. 136. ↑ Shepperson & Price 1958, p. 270. 1 2 Shepperson & Price 1958, p. 272. 1 2 3 4 McCracken 2012, p. 127. 1 2 Shepperson & Price 1958, p. 273. 1 2 Shepperson & Price 1958, p. 277. ↑ Shepperson & Price 1958, pp. 279–280. 1 2 3 McCracken 2012, p. 141. ↑ Shepperson & Price 1958, pp. 281–282. ↑ Power 2010, p. 19. ↑ Shepperson & Price 1958, pp. 283, 286. ↑ Shepperson & Price 1958, p. 289. ↑ Shepperson & Price 1958, p. 296. 1 2 Shepperson & Price 1958, p. 297. 1 2 3 4 5 6 Rotberg 1971, p. 137. ↑ McCracken 2012, p. 142. 1 2 McCracken 2012, p. 143. 1 2 McCracken 2012, p. 144. ↑ Yorke 1990, pp. 373-4. 1 2 Power 2010, p. 20. ↑ Power 2010, p. 21. 1 2 Rotberg 1971, pp. 137–8. ↑ McCracken 2012, p. 145. 1 2 3 McCracken 2012, p. 146. 1 2 3 4 5 Power 2010, p. 27. ↑ Rotberg 1971, p. 139. 1 2 3 4 Power 2010, p. 28. ↑ Rotberg 1971, p. 133. 1 2 Rotberg 1971, p. 138. ↑ McCracken 2012, p. 140. ↑ Rotberg 1971, pp. 158–60. Linden, Jane; Linden, Ian (1971). "John Chilembwe and the New Jerusalem". The Journal of African History. 12 (04): 631–51. JSTOR 181018. McCracken, John (2012). A History of Malawi, 1859–1966. Woodbridge: James Currey. ISBN 978-1-84701-064-3. Power, Joey (2010). Political Culture and Nationalism in Malawi: Building Kwacha. Rochester Studies in African History and the Diaspora. New York: University of Rochester Press. ISBN 978-1-58046-310-2. Rotberg, R. I. (1967). Strike a Blow and Die: A Narrative of Race Relations in Colonial Africa by George Simeon Mwase. Cambridge, Mass. : Harvard University Press. OCLC 184725. Rotberg, R. I. (1971). "Psychological Stress and the Question of Identity: Chilembwe's Revolt Reconsidered". In Rotberg, R. I.; Mazrui, A. A. Protest and Power in Black Africa. New York. pp. 133–64. OCLC 139250. Shepperson, George; Price, Thomas (1958). Independent African: John Chilembwe and the Origins, Setting and Significance of the Nyasaland Native Rising of 1915. Edinburgh: Edinburgh University Press. OCLC 421086. Strachan, Hew (2004). The First World War in Africa. Oxford: Oxford University Press. ISBN 0-19-925728-0. Yorke, Edmund (1990). "The Spectre of a Second Chilembwe: Government, Missions, and Social Control in Wartime Northern Rhodesia, 1914-18". The Journal of African History. 31 (3): 373–91. JSTOR 182876. Wikimedia Commons has media related to Chilembwe uprising.